While using the strongest authentication available may be the most secure option, this could result in significant cost. SMBs and IT departments should focus on continuous improvement to manage risk at a reasonable price. Remote Desktop Manager offers features that are team oriented at a low cost. Data sources are at the heart of Remote Desktop Manager; they are the containers that hold all entries. You can configure multiple data sources within the application and they can be of mixed type, but only one may be active at a time. It is easy to switch from one data source to another. Operate efficiently and securely in a multi-user environment by easily sharing sessions with colleagues and other team members. 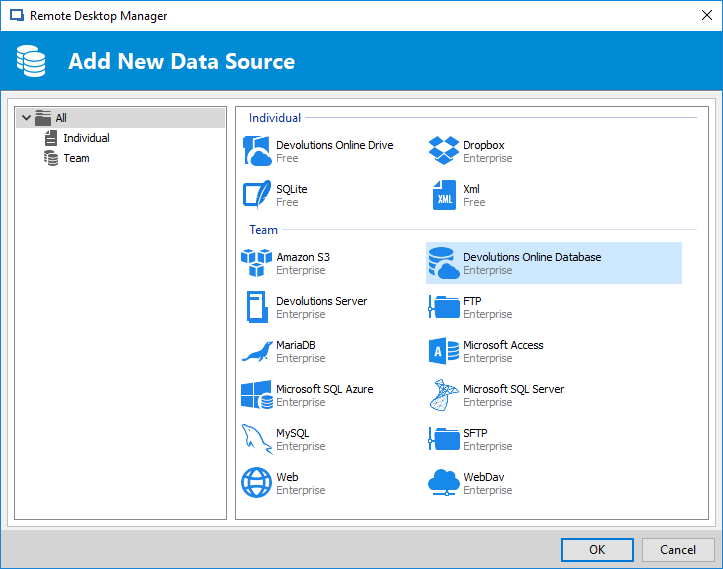 Remote Desktop Manager integrates with different data source types, from individual to team data sources, including: Devolutions Online Drive, Dropbox, SQLite, XML, Amazon S3, Devolutions Online Database, Devolutions Password Server, FTP, MariaDB, Microsoft Access, Microsoft SQL Azure, Microsoft SQL Server, My SQL, SFTP, Web and WebDav. Export and import your data source configurations to simplify deployment for multiple users. Repositories allow a database to be divided into multiple, smaller compartments. Instead of handling the whole database as a single block of data, each repository handles its own subset of entries, making it easy to manage massive numbers of entries without experiencing reduced performance. 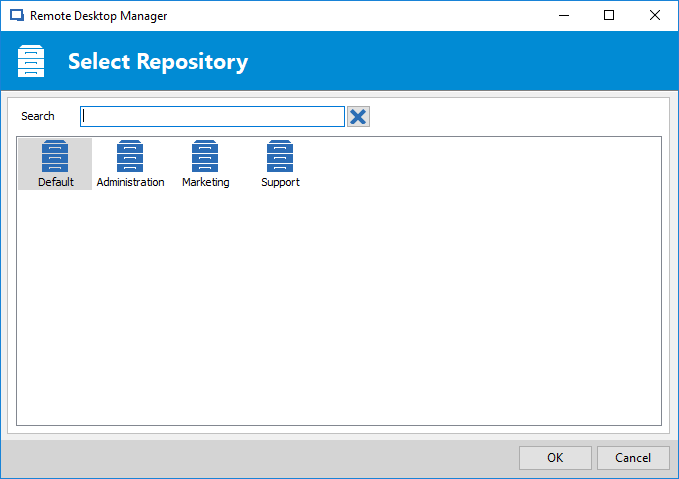 All repositories common to a database have the same set of users, security groups and roles; only entries differ from one repository to another. 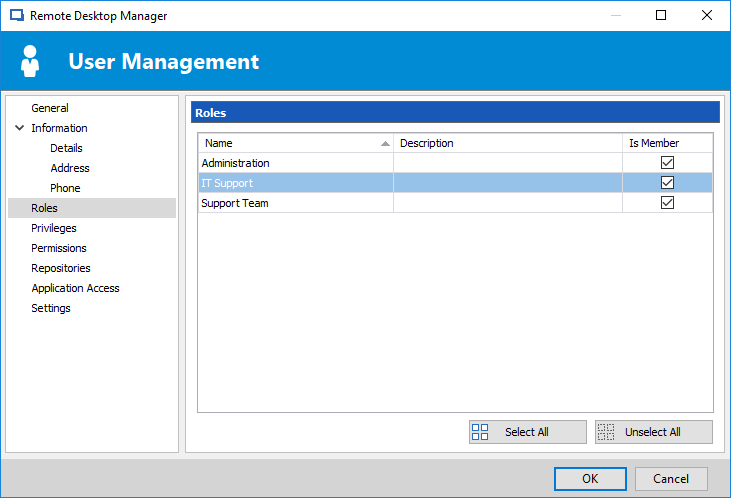 Roles in Remote Desktop Manager allows you to reduce the time it takes to manage users by granting selective permissions to multiple users at once. Integrated role management is mapped to the Active Directory groups. You can assign multiple roles to one user which will result in the union of all permissions granted. Our team is dedicated to helping you get the most out of our solutions.